(PHOTO: Joe Rossi) Kateisha and Tom. Learn more about these two. Bringing generations together in an intergenerational grassroots initiative, AGE to age is designed to connect youth with older adults to build relationships and enhance their communities. It certainly enhanced Rita Baresh’s quality of life. The 70-something volunteer, of Moose Lake, Minn., divided her time between the Moose Lake KIDS PLUS and AGE to age initiatives, resulting from the Northland Foundation’s partnership with Moose Lake community members. This initiative provides an avenue for different generations to overcome age stereotypes, establish friendships, and pool their strengths for civic good. Over 1,200 people age 55+, 2,400 youth and 1,300 adults from the generations in between have been touched by this program, and momentum continues to grow. 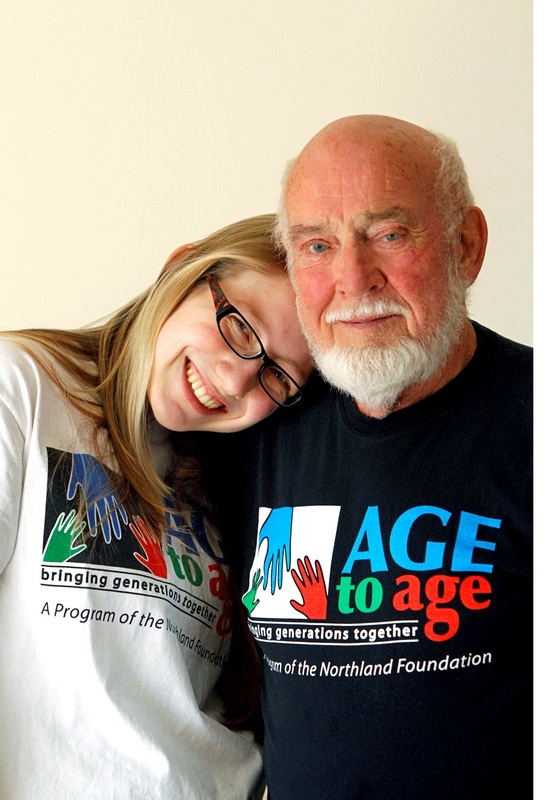 AGE to age’s “secret of success” lies in nurturing respectful relationships and empowering communities to embrace the unique talents of all ages. RSVP greeters were at the Chanute High School on Friday, April 18.
from left, Madison Dispensa, Rena Stair and Rebecca Wendt. EDITOR'S NOTE: Each week, we'll featur eintergenerational program ideas that were tried and successful. This new series is a tool to highlight various age-optimized programs and practices. The program descriptions are provided by representatives of the programs. Inclusion in this series does not imply Generations United's endorsement or recommendation, but rather encourages ideas to inspired other programs. The first intergenerational program in Chanute, Kansas, the School Greeter Program originated from a Chanute Vision Committee in 2005. A struggling rural committee engaged the “Public Square,” which comprised of citizens in government, education, health and human services, and business with a focus on identifying and taking action to improve the community. After the needs were identified the committees made proposals to meet the community need that would have a stimulating effect on the community. A student from Chanute High School stated, “We need school greeters.” Her recommendation was accepted and Chanute High School was the first school in the city to have the greeter program. The Southeast Kansas Retired and Senior Volunteer Program (SEK-RSVP), a program for those over 55 years of age, was instrumental in recruiting, training, scheduling, honoring volunteers and evaluating the intergenerational program. Since the program’s inception it has expanded to the point that all schools in Chanute participate in the greeter program. The description of this program centers on students receiving a welcome as they enter school in the morning. Older adult volunteers at the schools open doors, shake hands, high five, give hugs, visit with and share a smile with each student as they enter school. The schools give back by offering breakfast to the volunteers to show their appreciation, as well as providing an official t-shirt and identification badge. 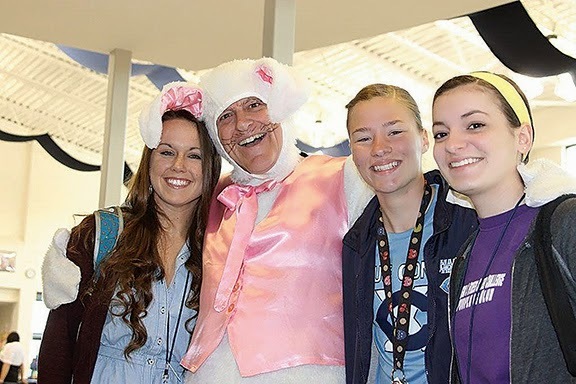 The students acknowledge the older adults when they see them out in the community and the older adults participate in other school activities besides the morning greeting. 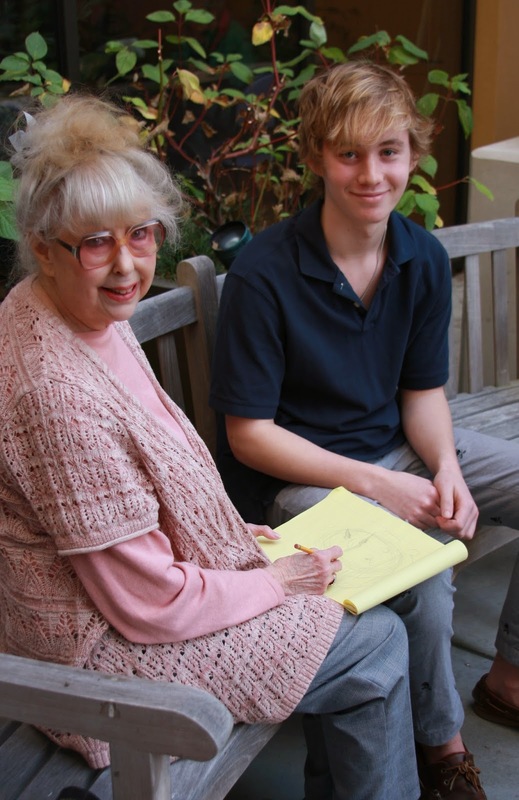 EDITOR'S NOTE: Each week, we'll feature intergenerational program ideas that were tried and successful. This new series is a tool to highlight various age-intentional programs and practices. The program descriptions are provided by representatives of the programs. Inclusion in this series does not imply Generations United’s endorsement or recommendation, but rather encourages ideas to inspire other programs. 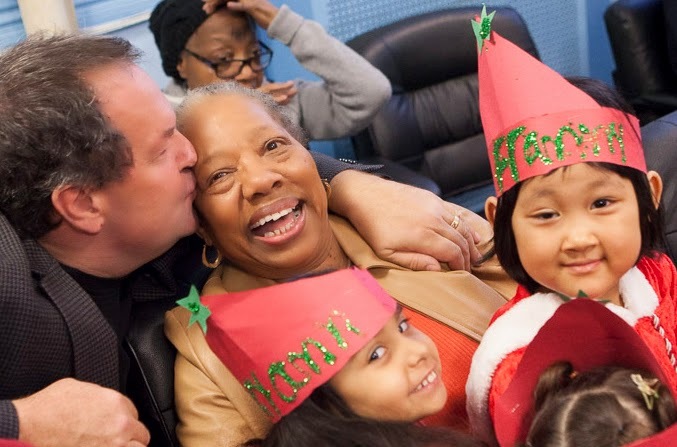 Since 2012, Opportunity Neighborhood - of New Brighton, Minnesota - and Little Brothers - Friends of the Elderly have been partnering to build social connections and fight isolation through fun informal events that bring large groups of youth and older adults together. Participating K-12th grade youth are from an after-school program Opportunity Neighborhood provides at Ames Lake Neighborhood, an affordable housing community in St. Paul. The older adults are identified through Little Brothers Friends of the Elderly outreach program that serves both Minneapolis and St. Paul. Events are fun and open doors for friendships to begin. Youth and older adults are paired up at tables to play games, create crafts or play BINGO. Social gatherings like this have shown to increase happiness and improve health in older adults. While in youth they have revealed improved educational learning and self-image. In addition to these events, youth create crafts monthly for Little Brothers Friends of the Elderly’s Friendship and Flowers care packages program that are delivered to homebound seniors. Grace Chen developed two critical skills while teaching older adults how to use new technology. Duncan McDonell had a break-through with an older student during an art class. Aaron Smothers learned an important lesson while documenting seniors. All three -- under the age of 25 -- are not only recipients of our Youth Jumpstart Grants, but they’re also among the millions of youth improving their communities every day through service. Youth advocates and mentors will celebrate those efforts this weekend as part of Global Youth Service Day (GYSD) 2014, the only day of service dedicated to children and youth. During that time, young people around the world will engage in work with schools, youth organizations, nonprofits, community and faith-based organizations, national service programs, government agencies and adult mentors. Established in 1988, GYSD is the largest service event in the world, with celebrations each year in more than 135 countries. The Washington, D.C., celebration kicks off today with the 25th Annual National Service-Learning Conference, co-hosted by the National Youth Leadership Council and Youth Service America (YSA). In honoring this annual event, we're highlighting a few young who addressed critical issues and changed their communities. 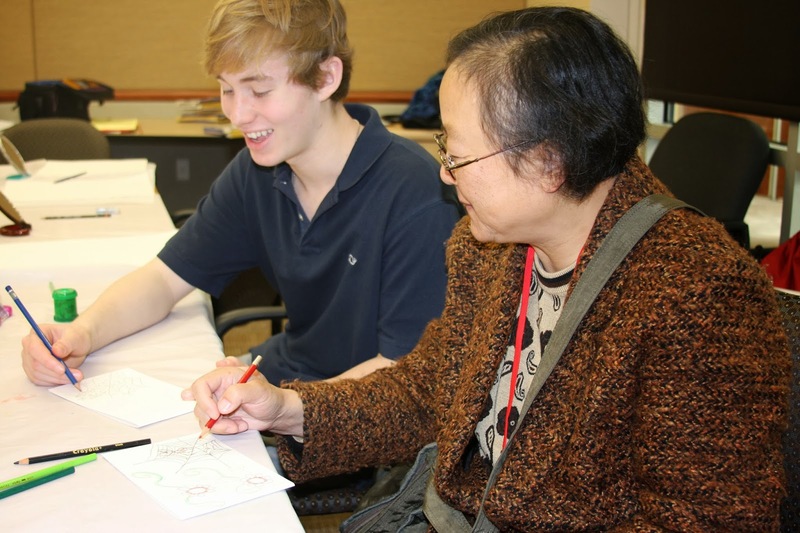 As part of the C & T Youth Technology Academy in Rockville, Maryland, Grace Chen was part of a project where she and her peers tutored older adults on how to surf the web, check e-mail, and operate cellphones, digital cameras and tablets. She developed two important skills: the first being patience. “As a high school student who is constantly balancing school work and extra-curricular activities, I never need to slow down or wait,” Chen explained. Life at the Ring House senior living facility, however, moved at a pace slower than what she was initially used to until she caught on. She also developed solution-based approaches to challenges. “When teaching some of the residents new technologies, it was easy to become frustrated,” Chen explained, recalling a day when the older adults struggled to click the left mouse button. When the residents grew anxious about their inabilities, the young tutor changed the direction of the conversation. But overtime, LiBorio came around and eventually painted a breathtaking nature scene and called McDonell’s name, which surprised everyone. That experience showed McDonell first-hand the benefits of young and old working together. Aaron Smothers' time with the City-Wide Resident Council was just as enlightening. In that project, based in St. Paul, Minnesota, Smothers and his peers explored the history of Roosevelt Community Homes, a 314-unit public housing community that built in 1952, through discussions with seniors and a video project that took 2nd place at a community film festival. He appreciated the opportunity to work with the Saint Paul Public Housing Agency and the Saint Paul Neighborhood Network (SPNN). Part of the program’s requirements included Smothers and his peers taking a seven-week media course over the summer to learn videography. The experience taught him something else. We are seeking families to profile for two sidebars for our signature report, 2014 Families in Society, that celebrates strong families. We'll release our report in partnership with the Alliance for Children and Families in time to mark the 20th anniversary of the International Year of the Family (2014) at an event on May 13 at the National Press Club. The first family we're hoping to identify is a Hispanic/Latino family with strong intergenerational connections. We're interested in what motivates their connections, what helps and what woulc help them have even stronger connections. The second family we're hoping to identify is a middle-income family with strong intergenerational connections. We're interested in how they exchange money and/or time across generations, what motivates that and what would help them be able to invest even more money and/or time in each other. We're also interested in how that family uses technology and if it enhances their exchange of time and/or money. If you know of any such family and could pass along their names and contact information to Generations United's Communication Specialist Alan King, we would be very grateful. What is a Program of Distinction designation and why is it so important? When we started the Program of Distinction designation in 2010, we thought it was important to recognize excellence while celebrating the rich diversity among intergenerational programs. That year, we recognized six programs: Kinship Care Resource Center, SMART (Students and Mature Adults Read Together) and Reading Buddies After School, St. Ann Center for Intergenerational Care, United Retirement Center/Avera, and Workforce Academy for Youth. The designation, which is active for 3 years and then must be renewed, serves as the only U.S. benchmark for intergenerational programs based on the criteria that underpin the effectiveness of any intergenerational program. Since the inaugural award year, we have recognized 11 other programs with this elite national recognition. Why is this recognition important for the designees? · outlined areas that could be improved to provide even stronger and more impactful programming. In addition to the designation logo for use with promotional materials, added benefits of becoming a Program of Distinction include national recognition through our premier listing on our website and priority inclusion in Generations United’s trainings, publications and resources. Consider becoming a Program of Distinction and being a part of this elite group. Please complete the short pre-application checklist to see if your program qualifies, then downloadand complete the application. The deadline is May 1, 2015.